Alaska might not be the first place you think of when you hear “spring break,” but the 49th state has a lot to offer this time of year. With the spring equinox fast approaching, there’s plenty of daylight, but there’s also still a ton of snow, making it a great time for all types of winter sports and exploring. Your friends might be off in search of warm sunshine and beaches, but if you’re looking for a different kind of adventure this spring break, just trade in the sandals for snowshoes and the white sand for fresh powder and come explore the Last Frontier this spring. You’ve landed in Anchorage, where you can officially forget the water skis. Glide cross-country style instead through Kincaid Park, or head up a mountain for some sweet downhill action. There’s nothing like relaxing after a day filled with skiing, so chase your adventure with some of the state’s finest craft brews. Tasting rooms at popular breweries like Cynosure Brewing, Anchorage Brewing Company and Resolution Brewing Company are a great place to wind down, chat with locals and sip on a variety of freshly brewed beverages. Other spring-breakers may be waking up to beaches filled with wild party animals, but remember, Alaska is filled with its own wildlife. Pack some snacks today and head south to the Alaska Wildlife Conservation Center, a short drive from Anchorage. If you time it just right you might get to see the purple mountains covered in snow at sunrise. Make sure to keep your eyes peeled for moose on your way, and don’t be afraid to pull over and watch the tide carry house-sized blocks of ice through Turnagain Arm. This drive is a destination in itself! Since you’re in the neighborhood, you can head down to Portage Glacier for a day on the lake, no boat required! You can walk, bike or ski across the frozen Portage Lake for a truly unique and extremely stunning view of the glacier. Time to head north! Hop in the car or take the train to Fairbanks, where you can enjoy a day of relaxation at the hot springs. It’s not a spa at the beach but we think it’s even better. Your night likely won’t end with a fireworks show but there’s a chance you might see the northern lights dancing across the sky. Pull out your camera and slow the shutter speed way down, you’re going to want some pictures of this! You’ve seen the mountains from the highway and you’ve seen them from your skis but today you could try hopping on a flightseeing or helicopter tour for a view that’s impossible to get from the ground. 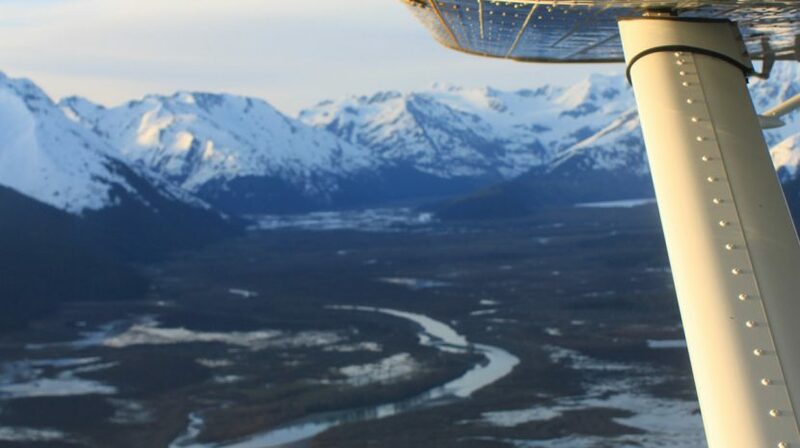 Alaska is huge and taking to the sky is the one of the best ways to see more of it. If you’re not much for heights, there are plenty of ways to get thrills while keeping your two feet (for the most part) on the ground. Instead of jumping on a jet ski and ripping across the open water, get your spring break adrenaline rush on the back of a snowmachine, or even on a dog sledding tour. For the traveler with a true sense of adventure and a love for the unexpected, we can’t think of a better spring break option than the Last Frontier.